Where most spiral galaxies have two twisting arms, a neighbor of the Milky Way is a four-armed monster. A new photo snapped by the Hubble Space Telescope, combined with observations by amateur astronomers, reveals these arms in stunning detail. The galaxy Messier 106 lies about 20 million light-years from Earth in the constellation Ursa Major (the Great Bear). Hubble scientists released a video of the four-armed galaxy in addition to the new photo. Beneath its pretty pink appearance, Messier 106 is harboring a monster black hole that is hungrily gobbling up matter at the galaxy's center. This black hole, scientists say, may be the key to the galaxy's mysterious extra arms. Spiral arms are bands of material that swirl out from the center of spiral galaxies. 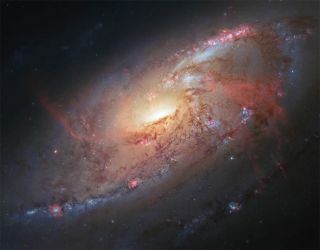 Most spiral galaxies have two, but Messier 106 has four. In addition to its prominent pair of main arms made of stars, this galaxy has two thinner wisps of reddish gas spiraling from its center. These extra arms are thought to be a result of the galaxy's central black hole, which produces two jets of material ejecting from the cloud of matter falling into it. These jets, in turn, disrupt and heat up the gas in the galaxy, causing the denser gas in the galactic plane to shine brightly. At the center of the galaxy, where gas is tightly bound, the arms appear to be straight, but on the outskirts, where the gas is held more loosely, it is blown above or below the main plane of the galaxy's disk, and curves outward. These arms appear bright pink in the new photo, which combines images captured by Hubble's Advanced Camera for Surveys, Wide Field Camera 3, and Wide Field and Planetary Camera 2, with ground-based observations taken by amateur astronomers Robert Gendlerand Jay GaBany. Gendler assembled his and GaBany's photos with archived Hubble Space Telescope data to create the new portrait.